As a preliminary measure, I have to question where WBC obtained warrants to peek into Swift’s bedroom window in order to gather evidence of her fornication. But that’s beside the point. 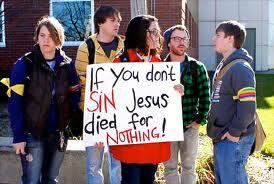 As most of the Animal Kingdom is aware by now, WBC attacks persons and groups it deems guilty of sin. Never mind that America’s debauchery has become so business-as-usual that examples of it aren’t even titillating anymore. WBC goes after the decadent with seriousness and vigor, as though by concerted effort they could eventually stamp out the evil among us, one person and one organization at a time. They do this because it’s easy. And fun. What Phelps does requires no prayer, no anointing, no self-denial, no struggle to suppress the flesh and walk in the Spirit. You can take a roomful of brash, unregenerate, foul-mouthed jerks and they’ll be able to accomplish everything Phelps does. And they’ll have the time of their lives while they’re doing it. I have to pause here and say that I am reluctant to discuss WBC at all. My conviction is that we would all be better off if everyone ignored this group. Not only would this deprive WBC of the press it loves, it would slow the hemorrhaging of credibility the real Christian Church is dealing with precisely because of fruit baskets like Phelps. However, WBC isn’t being ignored; to the contrary, the press loves to pounce on all its clownish displays as though they were relevant to something other than the peculiar psychosis that is found in Phelps’s neck of Topeka, Kansas. Of course, there is the basic reason that everything entertaining, inflammatory and sensational is junk food for the modern press. Simply put, because Phelps’s bizarre gyrations are fun and easy for the press, too; it’s ready-made copy. However, there is a deeper reason. 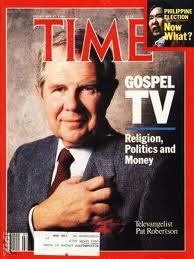 The secular press and broader secular America never met a Fred Phelps they didn’t love. 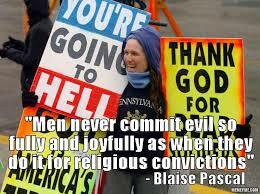 Oh, they all abhor what WBC does, its hatred and hypocrisy. But they love reading about it, and the more the better, because it eases the way for them to dismiss the real Jesus, who is love and mercy personified, calling out to a dying world. For those who are completely unenlightened, Phelps reinforces their belief that Christianity is a vast hoax, invented by social engineers to control the masses and get into their wallets. No, that isn’t Jesus. My Savior would get a backstage pass so he could sit down for a visit with Taylor Swift. He would speak to her with warmth and gentleness. He might not even mention the fornication. When I was developing my own convictions about Christ and morality as a much younger man, I felt strongly that Christians had an obligation to challenge the moral bankruptcy in American society, particularly since our strong Judeo-Christian heritage once guided us so firmly. Every believer sees the waste and ruin that have resulted from the secularization of American society. For years I dreamed of reversing it. But Christ can’t be preached through political wrangling. Christians should cease trying to use law and politics to reshape our society in Christ’s image. Our attempt to impose Christian morality on our secular society has been an unqualified failure that has done little except to popularize the caricature of the ugly Christian fundamentalist, out rapping sinners on the head with his Bible instead of feeding the poor and loving his neighbor. We should cast our votes at the ballot box, utter our opinions and leave it at that. Let our laws and our government run their corrupt course. We should put our energy into telling others what Jesus has done for us personally; maintaining strong church communities that will be a refuge for believers as well those who don’t yet believe; feeding the hungry; showing the character of Christ to the world. Our society as a whole will never again be shaped by Christian values. We should concentrate on helping those who want to escape the ruin that is overtaking the world rather than arguing with those who don’t. Phelps, if anything, is just another example of humanity’s condition, for which Christ died. 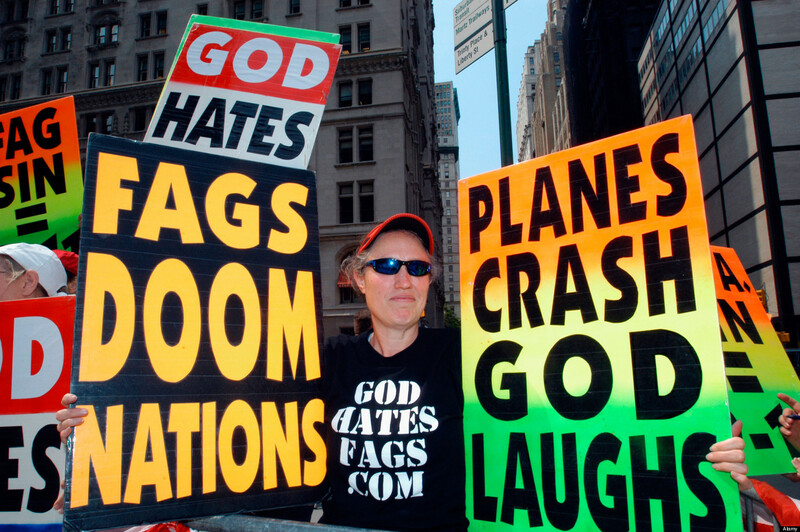 The fruit of Westboro Baptist Church is bitter and supplies no food to the society it claims it wants to save. However, our fixation on this group only encourages them. Believers and unbelievers alike should make a point of starving Fred Phelps of the attention he craves. It’s pretty clear the press has gone to his head. This entry was posted in Christianity in Politics and tagged condemnation, damnation, debauchery, decadence, evil, forgiveness, fornication, Fred Phelps, God, Gospel, grace, heathen, immorality, Jesus, kindness, love, lust, mercy, patience, politics, press, promiscuity, sexual immorality, sin, Westboro Baptist Church. Bookmark the permalink. A lot is happening in our culture today to bring this issue to the fore. I don’t stay up with the Taylor Swifts of our day but I do try to keep up with Supreme Court rulings, Dept of Justice lawsuits, etc. The question arises: How best to redeem our culture? How do we put action to being salt & light in today’s world? Your answer gets my vote: Preach & live the gospel of the Kingdom. Others take a more activist approach (besides their legitimate ballot-box vote): write you your Congressperson, run for office, join the Tea Party, support talk radio. Some of both goes on at our house — & both require a spirit of grace & compassion. Attitude is vitally important. So much is about healthy balance. Jesus was more likely to condemn the self-righteous than the hopeless sinner. Since He was reflecting God’s heart & we must also. He never got into politics, but there was no opportunity for that kind of response. By the way, Taylor Swift is Karis’ current favorite singer. At 9 years old & homeschooled I doubt she is privy to any/many lurid details — & I trust her parents point out the messages she sends in the lyrics of her songs. Glad you liked it, and thanks as always for reading, Auntie Sarah. Interesting that Karis loves Taylor Swift. I’m sure Danny and Carey will guide her in the matter.